The lenses for larger sized, megapixel sensors up to a diagonal of 22mm are also broadband coated and may be used alternatively in the visible (400-700nm) or near infrared (700-1000nm) ranges, but not both at the same time. 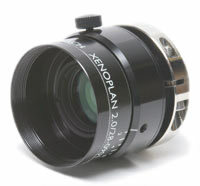 The 1.3” format lenses both accept an M30.5×0.5 filter thread. Compact Series lenses are also available for 11mm and 16mm sensors.